I have so many vivid memories of my mother, all circling neatly around food and cooking. 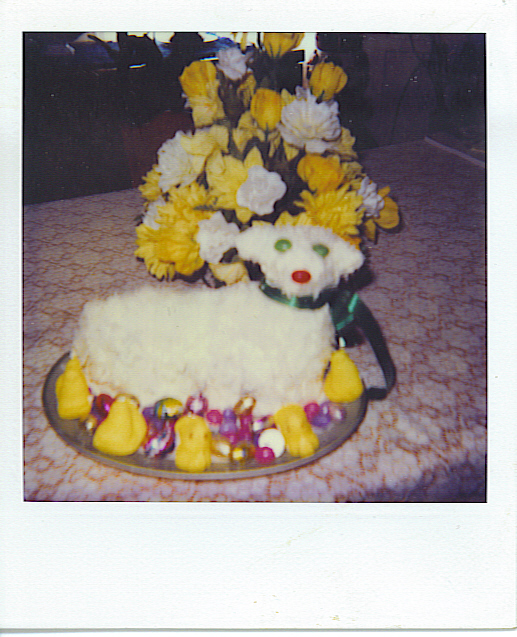 Easter lamb cakes were an institution. 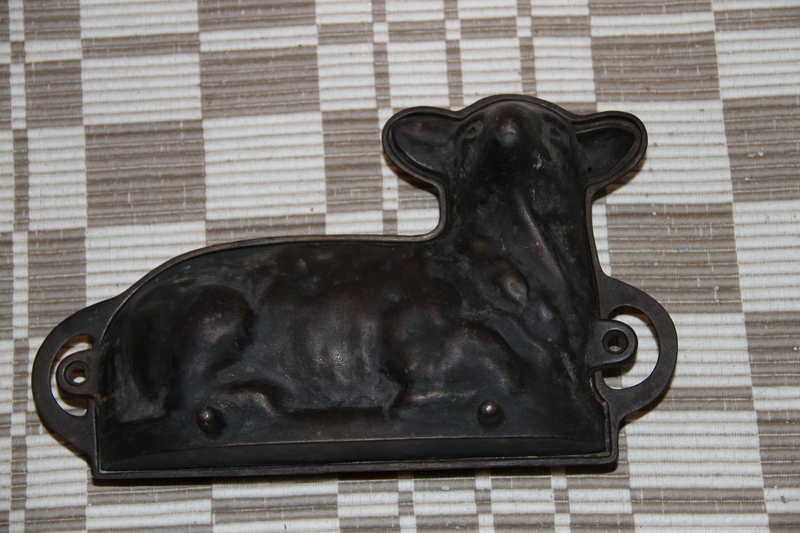 Mom had an old cast iron mold which had been handed down for many years. 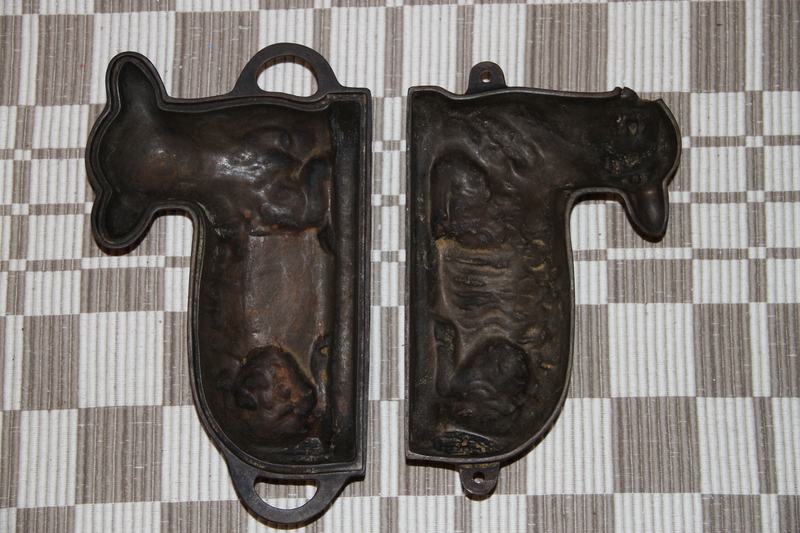 The mold came in two parts and the trick, apparently, was to fill one to the brim with batter, then place the other side down on top, with the cake expanding to perfectly fill the form and create the lamb shape. These cakes were usually a traditional white or yellow batter, but once in awhile, Mom would bake a special chocolate lamb. After cooling, the lambs were covered with frosting and liberally covered with a flaky coconut “wool”. Jelly bean eyes and noses were added, and cheery ribbons tied around their necks. Finally, the lamb would be nestled on a plate of lush Easter basket grass and adorned with an assortment of candies. When I moved to the West Coast, Mom baked one of these specialties, then held it on her lap for the seven-hour flight (not counting the layover in Chicago) so it would arrive in pristine condition. I wish she had carried the cake mold instead, and shown me how to bake one. When my sister and I tried to make our own lamb cake a few years back, we weren’t able to get the two cake halves to meld properly, so the lamb was slightly anemic and its head extremely wobbly. We stuck a few toothpicks through the dough, to no avail. The lamb took on a rakish, disapproving look (sorry, no pictures of that one). Long before the word “antioxidant” came into daily use, my mother introduced me to pomegranates, teaching me to cautiously free the tiny ruby gems from their thin, otherworldly membrane. The obvious reward found as each tiny, sweet-tart juicy seed burst upon my tongue. I learned to remove stubborn pistachios from their shells without staining my fingers, when nuts were still saturated in red food dye #2. Even now, the taste of pistachio brings me back to my childhood kitchen table. And I ate fluffy Armenian string cheese, following Mom’s example of patiently separating the little strands of cheese, recapturing errant nigella seeds, then popping a well-earned bite of fluffy, aerated delight into my mouth. But best of all was Mom’s apple pie. Apples blended to perfection, with just the right amount of cinnamon to add a pleasing tingly sensation with each bite. Juicy, not soggy; sweet, not grating; topped with intricate latticework and baked to a golden brown. The little bit of extra dough and apple slices were always put to good use. Sometimes, there would be a tiny doll-size pie, perfect for tea party play. But more often, Mom would roll out a couple of extra lattice strips, sprinkle them with sugar and cinnamon, place an apple slice or two on top, then roll them up and bake them until just crisped. My sister and I called them Apple Roll-Ups. A gift of food, certainly, but even way back then, we knew they were really a gift of love. 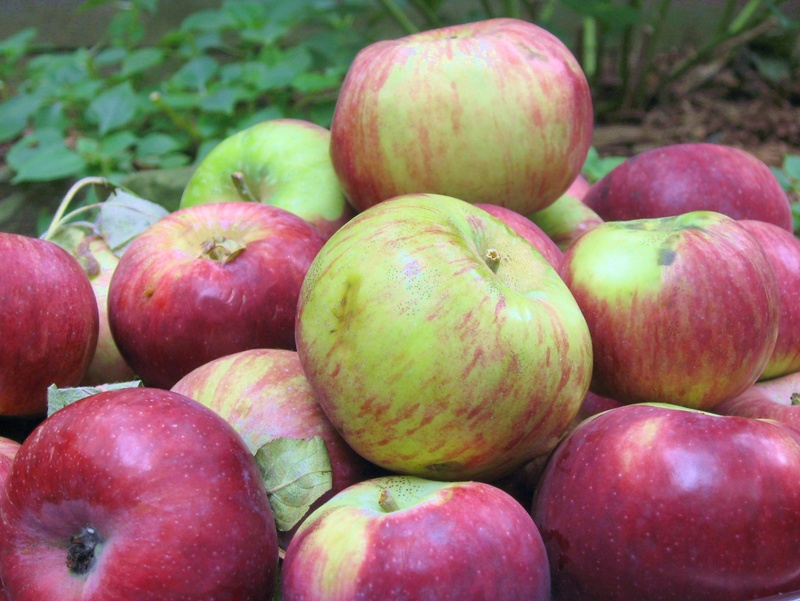 So, for Mom and apple pie, and for future generations who may have some wonderful food-filled memories of their own, I am documenting all my recipes. Thanks, Toby! My Mom was one of a kind. Nigella seeds are tiny black seeds from a plant native to parts of Europe, Africa, and Asia. They have a deep, concentrated flavor that works well with mild string cheese. I look forward to reading your essays. You are a very talented writer! Thank you cozy! That would have made my Mom happy. I look forward to getting to know you! Thanks for liking my apple pie post. I like yours! 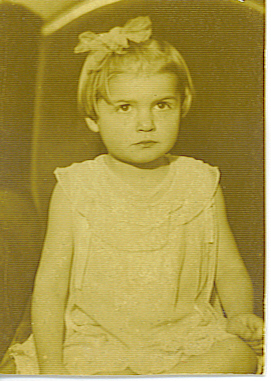 I worked as a photo archivist for many years, so I especially like your old family photos in this post. Thank you! Your apple pie looked truly scrumptious, and you know I love apple pie! 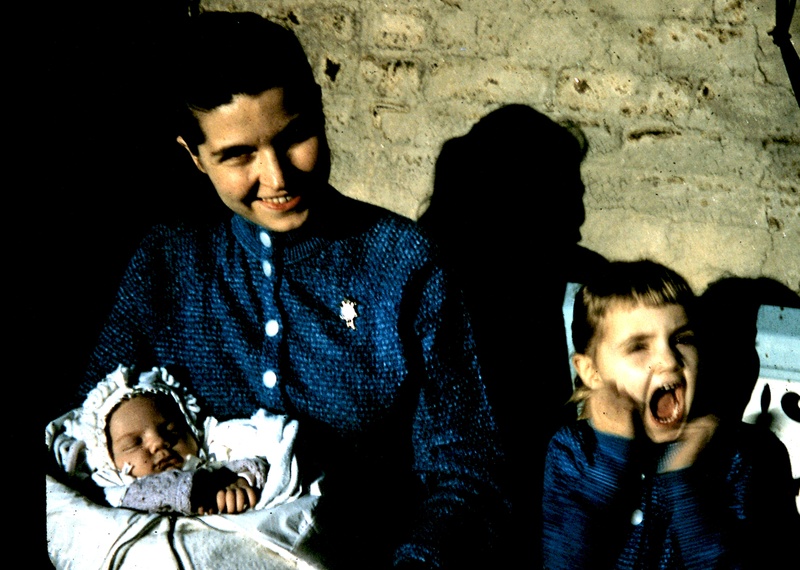 Old photos are wonderful – a glimpse into the past. What kind of photos did you archive? I worked at the Provincial Archives of Alberta as the Photo, Film and Sound Archivist, and the photos were anything to do with Alberta’s history: personal and family photos, pioneer life, early city street-scapes, First Nations, historic events, photojournalism, industry, nature, you name it! I have always found personal and family photos to be the most compelling, especially images of pioneer prairie women. How cool! I lived in Washington state for 10 years, and got the chance to go to Alberta several times. It is beautiful. The pioneers who settled out there had to be tough, for sure, to make it through the long winters! Do you still have some of those old photos? What beautiful and warm stories of your family. Recipes are mouthwatering. Thank You! . That’s so sweet! Thank you!! This is a lovely tribute! Nice photos, great tribute and what an awesome lamb shape!